I visited Robert Berman’s Gallery in Santa Monica for the Paid to Play opening show featuring rare art pieces Robert magically assembled from 1945-1985. Berman’s collection is an overview of the often overlooked Southern California artists rooted in illustration, commissioned to create imagery for record albums, magazines, advertisements, et al. The genre is commercial but still full of innovation, technique and artistic expression.There was a nice sized crowd gathered at the entrance sipping glasses of pinot noir and tonic water. I made my way past a group of people and found myself starting at a painting I had never seen before. I stopped, absolutely in my tracks, when I saw a painting of Michael Jackson and Lisa Marie Presley. Before I even saw the small “Ryden” signature in the right hand corner, I knew it was one of his creations. 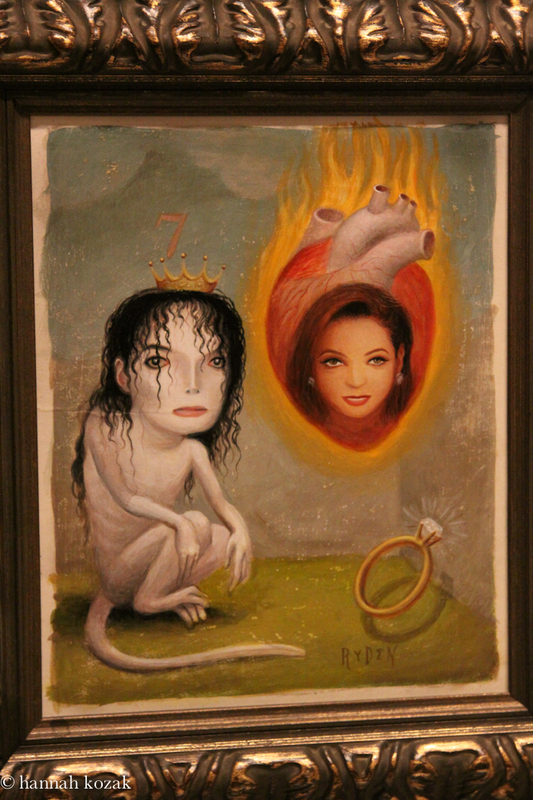 I’m a huge fan of both Mark Ryden and Michael Jackson so it was a genuine thrill to see a painting of MJ done by Ryden. By the way, Michael was a huge fan of Ryden as well. 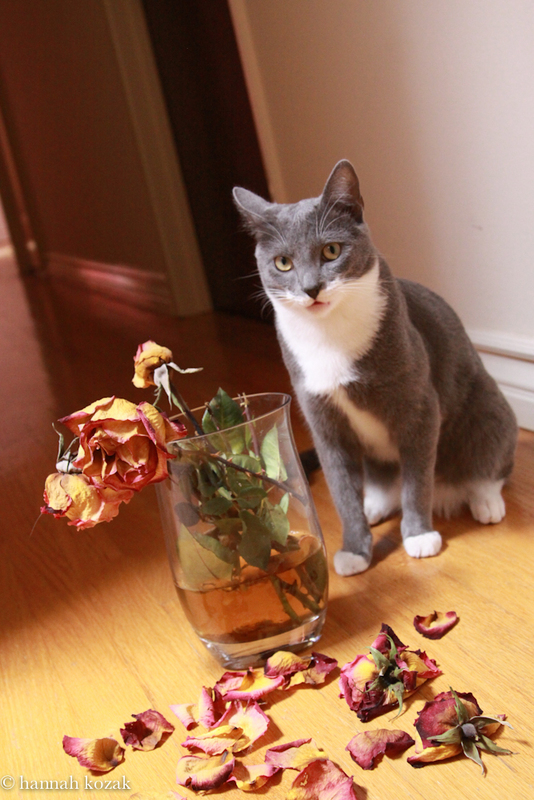 He commissioned Ryden to pain his 1991 Dangerous album cover. I was so taken with the painting that I drove home fast, and people who know me know I don’t drive fast, and wrote to Ryden. Not an email, I wrote Ryden an actual, old-fashioned letter. I hope he answers so I don’t have to guess about the meaning of his painting. He’s answered other letters of mine so there’s a good possibility he’ll answer this one. It’s the most provocative of Ryden’s creations that I’ve seen. I believe the painting was done sometime in the early 80’s. It shows Michael as a rat and I think he’s depicted with Lisa Marie Presley; who eventually broke his heart when she changed her mind about having children with him. If anyone has any information about this painting, please leave a comment. I have written to various art galleries but I have not received any information. Michael’s first #1 solo hit was Ben; a song about a rat. Michael loved rats and all animals from the time he was a young boy and had many as pets. Three year old Michael was even feeding a mouse by hand that lived behind the refrigerator at their home at 2300 Jackson Street. His mother screamed, Joseph would curse and and Michael would quietly slide away. I’m curious why Ryden paints Michael as a rat. Was it because our society treated him like an animal that was part of a test tube experiment? How much fame can one person handle before becoming a bit of a caged animal having to create a self contained Neverland world so he wouldn’t have to go out and be mobbed everywhere he turned? Most MJ fans know about Michael’s belief in the number 7. On the cover of History, he has a little arm-band with three 7’s. In order for me to see it, I had to use an Agfa Lupe, which has 8 x magnification. I set up some lights to photograph the cover to show you the “777”. 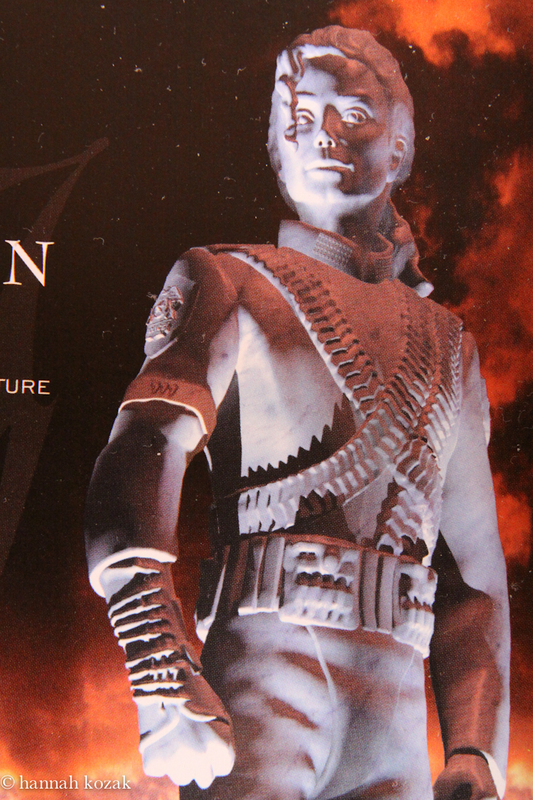 The metallic plated leg guards Jackson wore during his 1996-1997 ‘HIStory’ World Tour had a raised number ‘7’ etched on the lap on either side. He even wore “777” during his highly publicized witch hunt-trial in 2005. Could his world-wide success have manifested in part because he lived by and physically incorporated his belief about 7 into his life? One of the dancers in the Smooth Criminal video even calls out “7” at 2:55. By the way, Michael made the decision in tears to leave the church of Jehovah’s Witnesses during the filming of Smooth Criminal. He was given strict rules after the first day of filming and this was verified by his make-up artist/hair dresser. His options were to either leave the entertainment industry or the church for firing a gun during the filming. Michael Jackson was quite verbal about his personal belief and faith in G-d. I’m wondering if he focused on ‘7” because it appears in the Bible many times. The number of perfection is widely held to be the number ‘7’, God’s number. G-d rested on the seventh day according to the book of Genesis. Michael’s day of rest of Sundays consisted of a complete fast and he would dance until he could no longer stand. Could the 7 be completion of work? MJ had a strong work ethic instilled in him initially from his father Joseph and later from Berry Gordy, his “father” at Motown. The other idea of completion within the Bible comes from the death of Lamech who was apparently 777 years old when he died. This is the only occasion in the Bible where we see ‘777’ like this. The Apostle Peter asked Jesus how many times he would have to forgive someone who had done wrong against him. “I tell you, not just seven times, but 77 times” was Jesus’ answer. “Dancing the Dream” is Michael’s book of poetry and his reflections of life; published in 1992. In it he wrote: “So the elephants march on, and every tread beats out words in the dust: “Watch, learn, love. Watch, learn, love.” Can you hear them? One day in shame, the ghosts of ten thousand lords of the plains will say, “We do not hate you. Don’t you see at last? We were willing to fall, so that you, dear small ones, will never fall again.” He understood the concept, the guiding principle of the sutras of the Age of Aquarius which is simply to Recognize the Other Person is You. He believed we could work together to make ourselves better, that we should treat each other with respect. Most importantly of all, he practiced forgiveness. He forgave his accusers Jordy Chandler, or rather Evan Chandler and Gavin Arvizo or Janet Arvizo, of all their proven lies. He created soldiers of L.O.V.E. It is possible that Michael’s fascination and belief in 7 was his way of acknowledging the presence of G-d in his life and especially in times of personal trouble. He gained so much strength by his passionate belief in a higher power. Here are some more tidbits about the number 7 in regards to Michael. — Michael Jackson was the 7th of 9 children. — Michael Jackson’s memorial was on 7/7/09 … exactly 7 years after the will was signed. — His last 3 albums were all nearly 77 minutes in length: Dangerous: 76:58 History: 77:06 (Disc two) 71:39 (Disc one) Invincible: 77:08. This could be a coincidence since the length of cd’s in the nineties was around 80 minutes. –Conrad Murray was convicted of involuntary manslaughter over the death of Michael Jackson on 11/7/11. Personally I think he committed voluntary murder. -Conrad Murray was sentenced to four years in prison on 11/29/11. 9 – 2 = 7. How many performers have donated 300 million to charity? 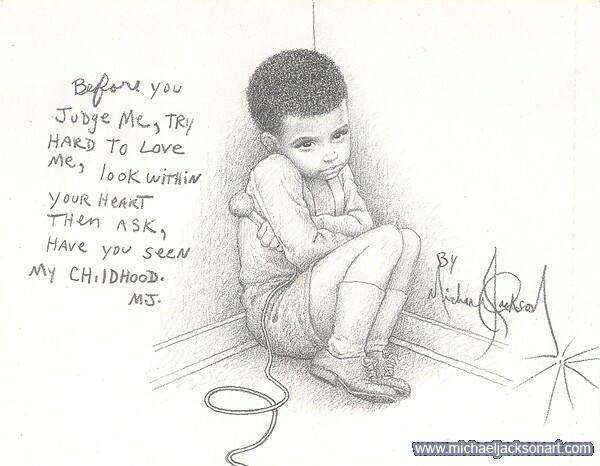 Michael’s genius talent was matched only by his caring, compassionate heart. A heart that loved and asked only to be loved. The Los Angeles art scene is invigorating. I’ve had a particular fondness for the Bergamot Art Station because it’s filled with so many galleries; all within immediate distance from each other. A former train station converted into not one but thirty galleries, make up this center in Santa Monica on Michigan Ave. Not only was there a line to get a parking spot but the area outside was packed with people. It thrills me that Angelenos wait in line to see new art. I headed straight for William Turner’s Gallery as I was excited to see Suzan Woodruff’s new exhibit; Luminous Matters. William Turner has been discovering emerging artists since he was the intermittent art editor for Venice Magazine in 1993. His gallery; with a grand floor space of 5,000 square feet, is known for emerging artists and high quality work from artists such as Woodruff. Last year I was transfixed by Woodruff’s paintings at her opening and this year was no exception. As I stood in front of Dragon’s Tail; a painting of reds and whites, I found my emotions begin to stir again, just like in 2010. Her paintings have an intoxicating way of stirring my emotions while instilling calmness and quietude. Woodruff says to paint is to embrace chaos and it’s clear that her touchstone is nature. She makes you see through new eyes by provocation and is inspired by O’Keeffe, Rothko,Pollack and even the Hubble Space Telescope launched by the space shuttle in 1990. Anak Rabanal; a cohort of William Turner, noticed me staring at the painting and we began to chat. She shared that Los Angeles has the highest concentration of millionaires in the U.S. per capita yet most high caliber art is exported to China, South America and New York. Three of the top 25 art schools in the country are in Los Angeles; UCLA, Art Center in Pasadena and Otis College of Art and Design in LA. She was passionately explaining how collectors buying art now will most likely end up donating it decades later. Next I headed to Robert Berman’s Gallery. Berman’s art gallery has been in Santa Monica since 1979. He was one of the first galleries to be located at Bergamot Station Arts Center and is clearly a passionate art lover who prefers edginess to his selection of art. 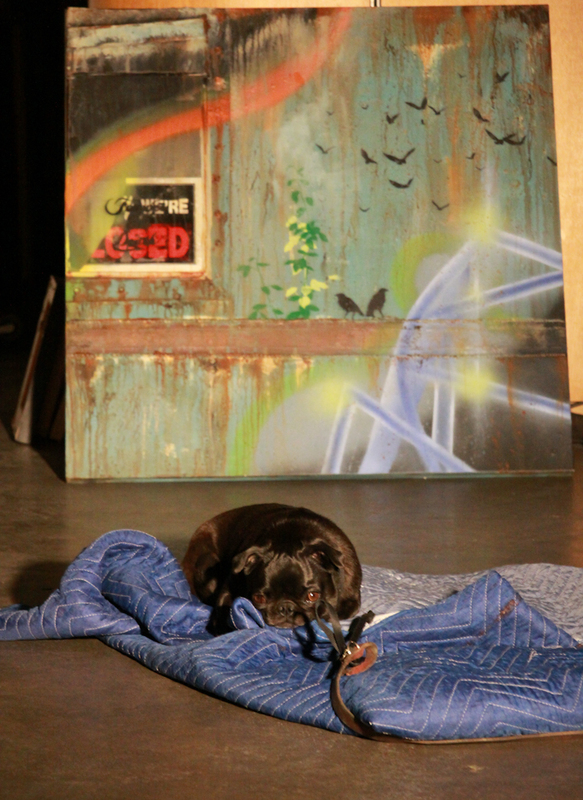 His show The Street’ N Low has a mixture of new surrealists, LowBrow art, and graffiti or taggers art. LowBrow art began in Los Angeles in the 70’s. Also known by the name pop surrealism; this art can often contain a sense of humor. A celebration of being white and American. What immediately caught my eye was Britt Ehringer’s Don’t Mess With Texas, 2008. 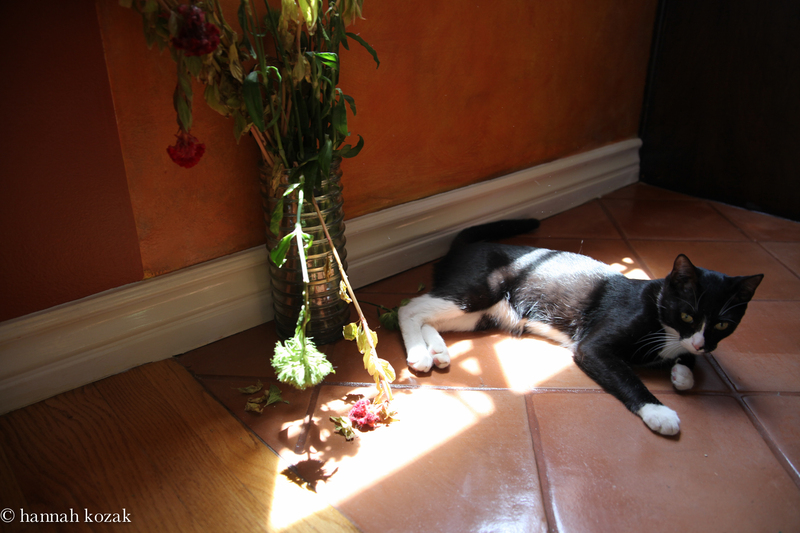 Ehringer gets his source imagery from the internet, personal photos, old girlie magazines, art books, dreams. His work is meant to operate as triggers; near-archetypes that open onto a whole sphere of imagery firmly entrenched in the collective subconscious. An American; he spent time in Asia in a marble quarry designing giant carved fireplace mantles, bathtubs, and columns. Don’t Mess with Texas is a woman from a nudist camp playing golf with mountains in the background and colorful cats. Luke Chueh’s Untitled, 2010. 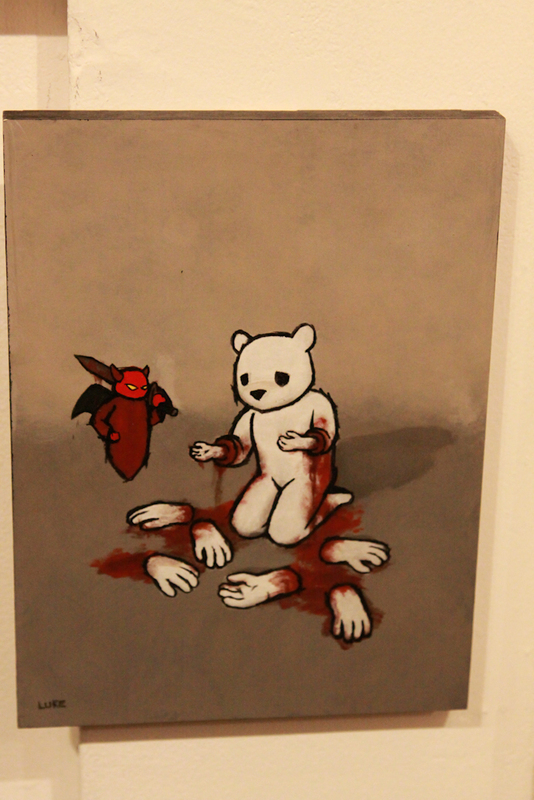 Chueh brings a bit of brute to cute with his paintings straddling comedy and tragedy. Some of his paintings have been made into vinyl toys and his work has been shown around the world. His art is like a nightmare and fun best friend all rolled into one. Or someone who’s got some serious issues but you just don’t mind. Last but not least; I am a huge fan of Mark Ryden’s work. 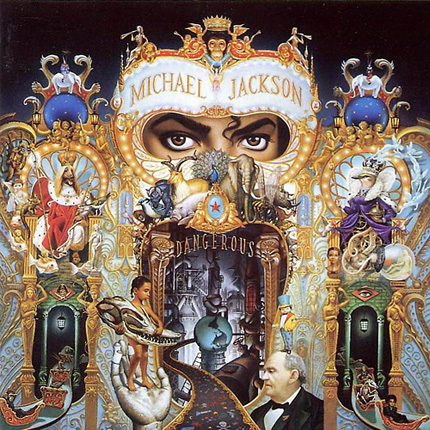 He was commissioned by Michael Jackson to paint his 1991 Dangerous album cover. 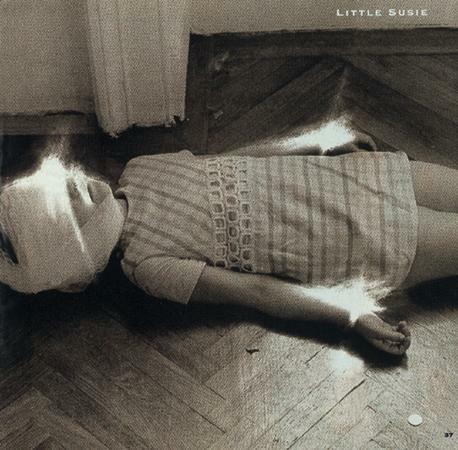 I have spent nights reading about the symbolism in that album. We see Michael’s kohl rimmed eyes under Bubbles, his chimpanzee. Glittering lights, cherubim, fairies, bones, insects, and animals all within a rococo design scheme. There were even references to Botticell’s The Birth of Venus, the coronation of King George VI, and Ingres’ Napoleon I On His Imperial Throne. Okay, I’m going to state something for the record here. The bald man on the cover is not Alistair Crowley; a well known freemason. It’s B.T. Barnum. Any MJ fan knows about Michael’s obsession with B.T. Barnum and his desire to create the greatest show on earth; which was Michael’s goal. Okay, I won’t go off on an MJ tangent. The dangerous cover is a separate subject on it’s own but no, it wasn’t full of occult symbolism. Have fun if you want to decode this art work by Ryden. 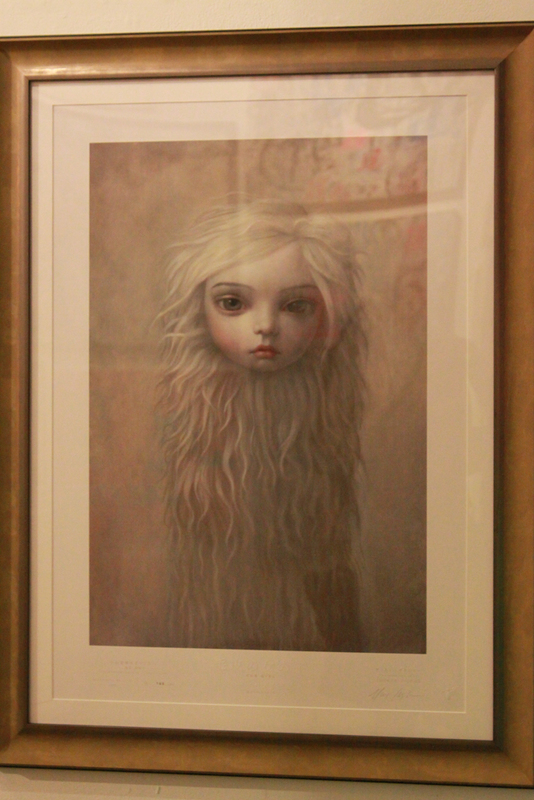 Mark Ryden’s Fur Girl caught my eye. What can I say about Ryden that hasn’t been said. He chooses subjects filled with cultural connotation which transcends the Surrealists’ strategies of working on the subconscious & collective memories. Always leaving the audience challenged by unnerving us. I leave you with a picture or two of Robert’s dog Sophie. 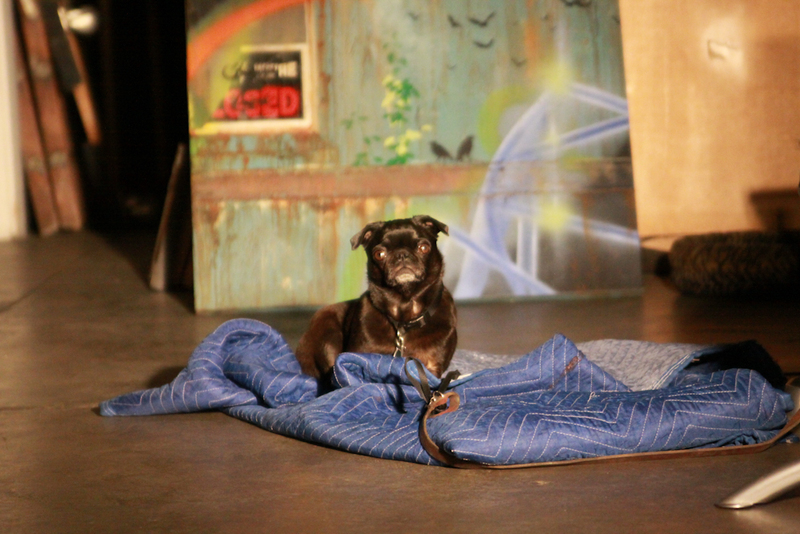 She was hanging out in the back of the gallery keeping an eye on things.